Far too often, companies dive head first into paid advertising and content marketing without putting real effort into figuring out exactly who their buyers or customers are. To create an effective marketing plan, you first must understand exactly who your target audience is—allowing you to create targeted initiatives that maximize your advertising ROI and content effectiveness. Boiled down to basics, knowing who they are gives you targeted insight into how to “reach” them: speak their language, address their pain points, answer their needs. To interpret core customer groups, it has become a common practice for businesses to create buyer personas. Not sure what a buyer persona is? Then read on below to learn how to build buyer personas for your industrial company and why they’re important to your business. A buyer persona is a fictional generalized representation of your ideal customer. 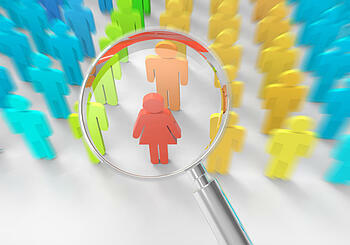 Depending on your business, you could have as few as one or two personas, or as many as five to 20. It’s common for small- to medium-size B2B companies to have two to five basic personas (which could multiply, depending on how many markets they serve). Personas are created to help you define and internalize the exemplary customer your business is trying to attract. Personas allow you to build a more complete picture of who your most coveted contacts are within the markets you serve. A mechanical engineer in aerospace may have different concerns and goals than one in medical device manufacturing. Buyer personas are made up of not only demographic information—age, location, income—but also psychographic information, such as interests, behavioral tendencies, and the motivating factors directing them towards your product or service. Having a comprehensive understanding of the buyer personas your business wants to attract is crucial for establishing content creation, product development, sales follow-up, and anything that relates to customer acquisition and retention. The more complete your grasp is on the behavior and concerns of your customers, the easier it will be to customize your content, messaging, customer service, and offerings to address their perceived needs. The need for hyper-targeted content is only expected to rise as the already crowded online space continues to grow. Luckily for marketers, the tools we use to target customers have also advanced immensely in the past few years. Platforms such as Google Ads and Facebook offer an ever-growing list of demographic and psychographic targeting options for businesses to create paid advertising campaigns directed at their specified buyer personas and customers. For the first time in history, even small companies with a limited budget now have access to very specific audience-targeting tools. To take full advantage of these targeting options, companies must put together complete buyer personas that help them define who their customers are, and what they like. Just don’t forget that even if you found a way to reach your personas effectively, your content still must be tailored toward their needs and provide them with relevant helpful information. If not, you’re just wasting your advertising budget. The biggest advantage to creating buyer personas is that it will help your business attract more qualified leads. Targeted content attracts the right audience. By creating content that speaks directly to the people you want to reach, you bypass audiences who aren’t an ideal match for your offerings. Reaching the right audience for your messaging will bring in high-quality leads—and eventually more revenue for your business. Ideally, most of you will already have a general idea of who is buying from your company and their motives for doing so. However, your buyer personas must be detailed to be effective—so putting in a little extra research into the things that make your customers tick will go a long way. Look at your customer database to uncover trends on how they consume your content. This will give you an idea about which forms of content are most effective, and the platforms you’re more likely to facilitate engagement from your prospects on. Tools such as HubSpot Analytics and Google Analytics are immensely helpful for determining your buyer personas’ online behaviors. You can also talk to your sales team about the types of leads they interact with on a daily basis. Often your sales personnel will have detailed information about how these leads found your business and the issues that motivated them to conduct their research in the first place. The key question to ask your sales people: what generalizations—and any unique specifics—can you make about the types of people you service? Remaining aware of the current issues affecting your industry will help your marketing team solve industry-specific problems for your customer base. This includes understanding the laws, regulations, and urgencies that your customers face. For an industrial manufacturing company, this could be something as simple as whether or not the cost or style of a particular product is more important to the purchasing manager researching your offerings. The more you actively monitor your environment, the better you’ll be able to position your products or services as a solution to the common hurdles facing your personas. This recent blog by Larson Tool is a good example of how a metal stamping manufacturer addresses industry concerns about the uncertainties of tariffs in today’s economy. Due to the dynamic nature of the global tariff situation, the larger discussion about tariffs is better left to economists, but Larson is able to speak to prospects and customers to inform them of the processes it has in place to mitigate the risks associated with tariff fluxes. The best way to figure out who your buyer personas are is to actually talk to them. They will tell you exactly what their problems and needs are/were that led them to your product. For B2B industrial companies, it’s a good idea to interview customers from each industry you serve—one buyer persona simply won’t be effective for companies with roots in multiple industries. What is the buyer’s role in their company? Does the buyer live in an urban, suburban, or rural environment? What is the buyer’s biggest challenges at work? What is the buyer’s biggest fears? What is the buyer’s most common objections? Don’t forget to interview your “bad” customers, too. Customers who requested refunds or canceled their engagements with you can provide great insight into the problems they experienced with your company or the reasons why your product wasn’t a good fit for their needs. This inside information can help you narrow down the types of personas you service well and the ones that may not be worth engaging with. You can also use their responses to help improve your offerings by trying to amend the issues previous customers endured. Use all the information you’ve gathered from the steps above and start constructing your personas. They should be thorough and include both demographic and psychographic information. Know the types of companies each persona works for and what their role is at the organization. It’s also important to recognize each persona’s challenges and long-term goals. Determine the education level of your prospects and what their preferred means for researching and buying from a company are. This broad outline of your ideal customer will allow you to effectively communicate to your personas how your company can solve their issues and help them reach their goals. What are the characteristics of their personality? What are the goals of his/her company? What are his/her biggest pain points? What challenges are he/she facing? How does he/she usually conduct purchases? What are his/her biggest motivators for purchasing? What are his/her objections or possible barriers to purchasing? Add a photo to represent the semi-fictional character. Add a personal philosophy quote that sums up the attitude. As a final note, it’s important to remember that buyer personas are dynamic. As your company evolves, so will the problems and needs of your customers. Continue to update and revise your personas to keep up with changes that occur naturally over time. Creating buyer personas can seem like a daunting task for manufacturing companies, but if you need help, Grant Marketing is here to guide you through the process. As a full-service marketing agency—with capabilities including content creation, account-based and inbound marketing for manufacturers, brand development, website design, and more—we can help you research and construct accurate buyer personas that will help you attract more qualified leads to your business. Download it now and start really getting to know the people your selling to!